From making lifelong friends to knowing someone will keep an eye on your home while you are away there are plenty of benefits of a friendly neighbourhood. Here are 10 ways to settle into your new neighbourhood. On move in day you may find some neighbours pop over to say hello. It’s a stressful day but try to take the time to smile and say hello. Once you’ve moved in pop round to close neighbour’s houses and introduce yourself. Don’t force your way through the door and settle on their sofa for the evening, just say hello, make friendly chit-chat and ask for any useful info you need such as what day the bins are emptied or where the nearest play park is. Head down to your local pub for a drink. But rather than taking a table stay at the bar so you can chat to the staff and get introduced to other people. Find out if there is a quiz night as these can be a great way to get to know people. We’re not suggesting a rave…that is unlikely to win you many friends on your street. But a housewarming party or summer and Christmas drinks is a low-pressure way to meet all your new neighbours and start building a rapport with them. You get back from a local community what you put in. 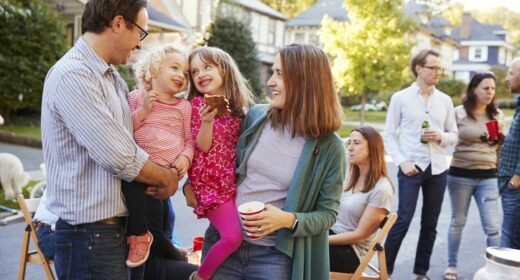 It may not have been top of your to-do list but spending time in your front garden gives you a chance to say hello to people and for your neighbours to pop over and introduce themselves. So be visible, spend some time sweeping your driveway, washing out your wheelie bins and getting your front hedge or fence in order. If you have children, you probably have a nice group of friends and playgroups you attend. But make an effort to go to the ones located in your new local area. It should help you meet the parents on your road and for your children to get to know each other too. Check for a local Facebook page or kids’ activities at the local library or play centre. It may be the world wide web, but the internet is really useful for finding out about what’s going on in your area. Nextdoor.co.uk is free to join and allows people in your community to post about local events, crimes to be alert to and with local second hand items to buy and sell. Alternatively, Facebook often has pages set up for local communities where you can share information. Have a search and find the right groups for you. Help keep your community safe and cut your insurance premiums by joining your local neighbourhood watch or setting one up. There are 99,000 schemes across the country and having one has been shown to reduce crime by 26%, according to The Times. Building a strong community is what Neighbourhood Watch is all about so get involved and you will meet plenty of people in your area. As an added bonus some insurance firms offer a 5% discount on their premiums to members of a Neighbourhood Watch scheme. Find out more about how to get the best home insurance deal. A shared interest is a great way to get to know people so join your local sports team, fitness class or book club. You can find out about groups and teams in your area either via Facebook or Playwanted.co.uk or Gomammoth.co.uk. Need a tool, piece of equipment or a tent? Borrow it from your neighbours and you can save money while getting to know people. App “Borrow-it” will put you in touch with people in your local area who have the lawnmower/roof rack/wheelbarrow you need. Alternatively, you could sign up to BorrowMyDoggy. This puts you in touch with people in your neighbourhood who need their dog walking or looking after. You get a part-time pet and a new contact in your area. Get to know people and help improve your neighbourhood by volunteering. Whether it’s helping in a soup kitchen, taking part in a litter picking event, helping the elderly or assisting your local Scout group you’ll meet plenty of people.